The small community briefly saw its population increase about 50 percent, May 27, where people from the around neighboring towns came to honor its fallen service members during the Colp Area Veterans Celebration, Dedication and Remembrance ceremony. 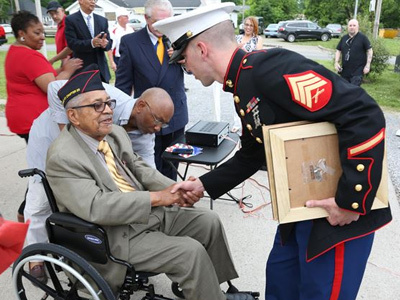 Two Marines with 9th Marine Corps District, stationed at Naval Station Great Lakes, Illinois, were on hand, where they were able to honor four local Montford Point Marines – who were among the first African Americans to serve in the Marine Corps during World War II. Nearly 20,000 African-Americans joined the Marine Corps in 1942, after President Franklin D. Roosevelt issued a “presidential directive giving African Americans an opportunity to be recruited in the Marine Corps,” according to the Montford Point Marines Association website. They didn’t receive recruit training at San Diego or Parris Island, however, but Camp Montford Point, N.C., a segregated training site for African American Marine recruits. For the next seven years, the camp remained opened until it became desegregated. The four Marines are Sol Griffin, Jr.; James L. Kirby, Earl Taylor, Jr. and Archibald Mosley. These Marines, among many other Montford Point Marines across the country, were awarded the Congressional Gold Medal, the highest award that can be given to a civilian by Congress, in 2012. Congress unanimously voted to recognize the Marines with the medal on Nov. 11, 2011, to recognize their contributions to the Marine Corps during the racial, tense times. Then-President Barack Obama signed the legislation into law, 12 days later. Mosley, who served in the Marine Corps from 1942-1946, is one Colp’s two Montford Point Marines still living. Taylor is the other and lives in Detroit. He was in attendance to accept the Congressional Gold Medal plaque, created by local townspeople. Despite what Mosley described as a “physical sacrifice,” to get into a vehicle due to his ailing legs, the 93-year-old, who lives in Nashville, Tenn., at an assisted living facility, made the three-hour trip with one of his daughters so he could tell the story of the Montford Point Marines. During the ceremony, multiple speakers, many of whom were veterans, spoke about the importance of remembering the sacrifices of the fallen. One such person is Jim Gentile, a local man from a nearby town who always wanted to give back to the military. He spearheaded the event that took place next to the town’s post office. While going through their initial training, Mosley and other black Marines endured more hardships recruits would normally be used to, such as not getting hot showers and living in cardboard shacks. Despite the racial treatment they received, it made Mosley and many more driven to get through the training and overseas to the fight. Mosley, along with more than 10,000 other Montford Point Marines, went on to serve in battles like Iwo Jima and Okinawa, performing admirably and enabling them to serve in follow-on conflicts such as in Korea and Vietnam. Sergeant Mike Stachowski and Lance Corporal Jake Lamb were able to hand-deliver the Congressional Gold Medal mementos to Mosley and to the families of the other recipients. In addition to hand delivering the mementos, the Marines placed a wreath front of a sign, with the town’s more than 400 service members on it.